Jim’s Jarhead Jerky is the creation of Jim Ewen, a retired Marine, based out of Medford, NJ. The brand started out in 2009 when Jim started shipping batches of homemade beef jerky to his son stationed in Iraq. His son shared it with others, and soon Jim found himself shipping out hundreds of pounds of jerky regularly to both Iraq and Afghanistan. After his son returned home, Jim continued the success by contracting with a manufacturer, and selling his famous jerky to stores. Ingredients: Pork, beef, vegetable glycerine, charsol (liquid smoke), potassium sorbate, salt, light brown sugar, crushed red pepper, cayenne pepper, black pepper, modern cure, activa, paprika, garlic, Red 40. These sausages actually have a light casing around them that is easily bitten into. Once I took a bite, the sausage gives off a light snap and crunch, and chews with a consistency more like a regular sausage/wiener, and not as mushy as a big brand like Tijuana Mama. It also has a cleaner taste, much less fatty and greasy. Otherwise, it tastes very much like a standard wiener but pickled with the classic vinegar, garlic, and cayenne seasonings. I want to say that it has a little more of a dill seasoning, comparable to dill pickles, but still light. Spiciness: These are definitely spicy. But they’re not “hot”. On my personal heat scale, I’d rate these as “medium” (level 3 out of 5). I get a clear sense of heat on my tongue that comes on right away, but it never rises to the level of discomfort. If anything, the vinegar and salt flavorings might make this feel more spicy that it really is. Chewing Texture: It starts out feeling crisp, and bites with a light snap. It has the same texture and constitution of an actual hot dog/wiener fresh out of a package. If anything, it might feel a touch more stiff. 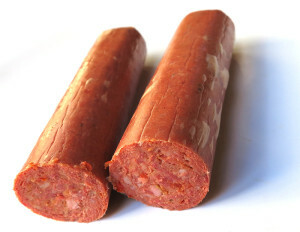 There’s a light casing the easily chews and bites through, and actually keeps your fingers somewhat clean than if you were to handle the actual sausage. As far as pickled sausage goes, I like these a lot. I’m particularly impressed with the chewing texture. I like the initial crisp and snap bite, and the feel of a real, fresh-out-of-the-package wiener. It has a clean taste, not greasy or oily, and these are not as smelly as other pickled sausage brands can be. The light casing actually helps makes this more enjoyable. 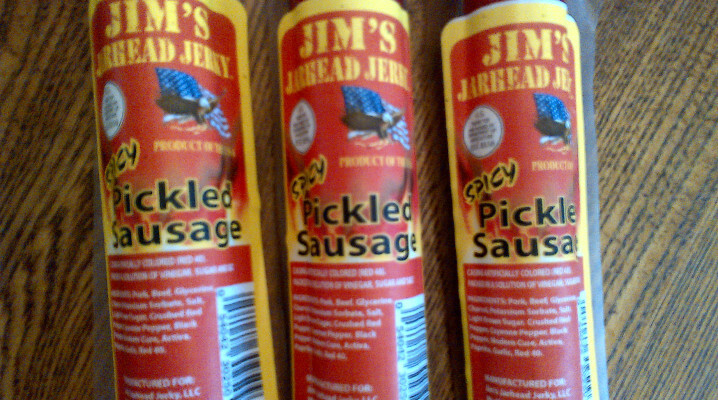 If you’re already a fan of Tijuana Mama, Fire Cracker, or Hannah’s, I think you’re really going to like these new sausages from Jim’s Jarhead Jerky.